The heat is on and summer is officially here. If you are looking for a cooler place to have an escapade during the hot summer days, this writer is recommending San Remigio. It is a hinterland municipality in the mountainous portion of this sea-horsed shape province we call Antique. San Remigio is a 3rd class municipality which has an agri-based economy. Its main agricultural products are coconut, coffee, rice , corn , banana and vegetables. Although it is an inland municipality with 70 percent of its topography best described as upland and the remaining 30 percent is flat lowland and/or rolling hills, San Remigio has lots to offer, more especially during the summer days. San Remigio takes pride in having hilly and high elevation and thus it is enjoying cooler breeze and a very cold atmosphere even as early as 2 o’clock in the afternoon. Fogs is abundant, more specifically in Brgy. Aningalan and its neighboring barangays. And because of its Bagiuo-like atmosphere , vegetables that usually are grown in Baguio and the Benguet provinces can be grown also in Aningalan, like lettuce, carrots, cucumber, tomatoes, and strawberries. 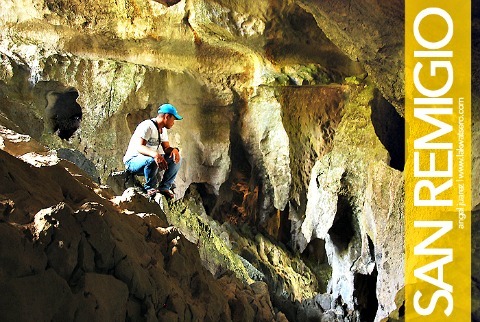 It is also in this upland barangay that a unique cave named Igbaclag Cave is located. It is more of a castle and not a cave. The barangay-LGU allotted a good portion of their Internal Revenue allotment (IRA) and built an iron bridge to connect a hilly portion of the land to the crystal castle. It is a sort of hanging bridge but it’s safe. Once the visitor steps on the crystal-white grounds, one can feel an eerie feeling and if one is sensitive enough, a soft murmur of the wind, so refreshing yet so mystic can be felt. Igbaclag Cave is frequented by local and foreign tourists, almost everyday. But more so during the Holy Week. To the mystics, it is a place good enough to find “pangalap” or amulets. To the weary soul, it can be a good respite from the noisy world in the cities. To the repentant, it can be a good venue to perform “panata” or just to reflect and find solace within oneself. Brgy. Aningalan is just 25 kilometers from the town proper of San Remigio. One can hire habal-habal or motorcycles suited for the traverse upward. But the place is reachable through a good road network, and the view is spectacular. Families can bring their tents and camp – out in the open fields and have stars watch over them at night while they sleep. The place is generally peaceful. San Remigio is also very rich in history and stories of the old days, specifically during the time of Sumakwel and the ten Bornean datus. Did you know that there is a place in this municipality that is called “itlog ni Sumakwel” because there is a sort of a depression in the mountainside that if one looks closely, shaped like the testes of the esteemed of all Datus, Datu Sumakwel. In the story of old, Sumakwel was a hunter who used to hunt in the forests and mountains of Antique, particularly from the hillsides of Tobias Fornier, farther north to San Remigio and on to Mt. Madja-as in Culasi. One day, while carrying a large doe, he jumped from one side of the mountains of San Remigio to go down to what is now Maninila River. His foot somewhat slipped on the slippery and wet trails, and so he slumped a little and his testes created a depression on the hillside. Until today, one keen observer could notice that depression on the hillside or the western side of Brgy. Bugo. San Remigio has many tourist sites beside the ones mentioned. In Barangay La Union, a windy stairway was created and was patterned to the shape of the mountains, which is surprisingly, made of corrals. Once one gets to the top, one has the mountains all to himself. From there he can see a grand view of the whole town, a portion of Sibalom, Patnongon and farther still, the town of San Jose de Buenavista. It is also very cold up there. And yet down below, there is a cave called Bato Cueva where the entrance is so small one has to squeeze his body to get inside. But once you are inside the cave, although it is slippery there and a lot of moss has grown, one can feel the enigmatic aura of the place. It is of common knowledge that the cave used to be a burial ground during the Japanese invasion. Old folks would tell stories that there were lots of golden statues left there by the Japanese armies. This mountainous town is also home to the larger specie of rafflesia speciosa, the world’s biggest and weirdest flower. Most of its forest cover happens to be the favorite habitat of this flower. Tourist would flock to the sites once news of its blooming period spread throughout the province. You see, rafflesia blooms only in a limited time. After two or three weeks of blooming, it starts to wither and die. But for somebody who is not a native to the place, like me, San Remigio is just like a home next to one’s home. Besides its beauty spots and therefore a good potential for tourism, its inhabitants are an epitome of a people so hospitable, so complacent and joyful. Everywhere you go in San Remigio, people has this penchant to greet visitors, to smile and to treat everyone like a brother. It is indeed a nice place to come home to, especially during this dry and humid summer.